Intellectual property (IP), in the Australian legal context, is much more than copyright and trade marks, it includes confidential information, registered designs, trade secrets, patents and plant breeder’s rights. The protection of intellectual endeavours has been something which the law has recognised for centuries and something which the innovation agenda has embraced. IP is becoming increasingly important as organisations strive for competitive advantage in the innovation age (click here or insert). IP rights arise at both common law and statute and aim to protect a broad category of rights over the fruits of intellectual efforts. These rights fall into two (2) distinct categories, those that are registerable and those that are not. This article aims to provide a short introduction to each type of IP and will provide the reader with links to further information as required. Registering a trade mark under the Trade Marks Act 1995 (Cth) is a way of protecting a brand to ensure that it can proceed with less likelihood of being confused with other brands. The development of a registered trade mark is a vital component of an effective marketing strategy for goods or services. A trade mark can be a letter, number, word, phrase, sound, smell, shape, logo, picture, aspect of packaging or any combination of these. A certification trade mark is a right that signifies the bearer of the trade mark has met an official standard, such as Australian Made. The standards often associated with a certification trade mark include quality, content, method of manufacture and origin of manufacture. While a certification trade mark is a form of trade mark, there are fundamental differences between a certification trade mark and a standard trade mark. Where a standard trade mark is designed to only allow the registered owner to utilise and receive the benefit of the trade mark, a certification trade mark is, generally, extensively licensed out to third party manufacturers and service providers, who are subject to their compliance with a set of rules or standards. the patent owner commercialises and obtains the economic benefit from the invention. During the patent period the owner is entitled to defend the invention against infringement. Suitable for New inventions involving an inventive step that represent more than a simple, obvious application of knowledge. New inventions involving an innovative step rather than an inventive step or where an invention may be superseded in a shorter period of time. Requirements Must be a ‘manner of manufacture’, new inventive, useful and not previously used in secret, s 18(1) Patents Act 1990 (Cth). Must be a ‘manner of manufacture’, new innovative, useful and not previously used in secret, s 18(1A) Patents Act 1990 (Cth). 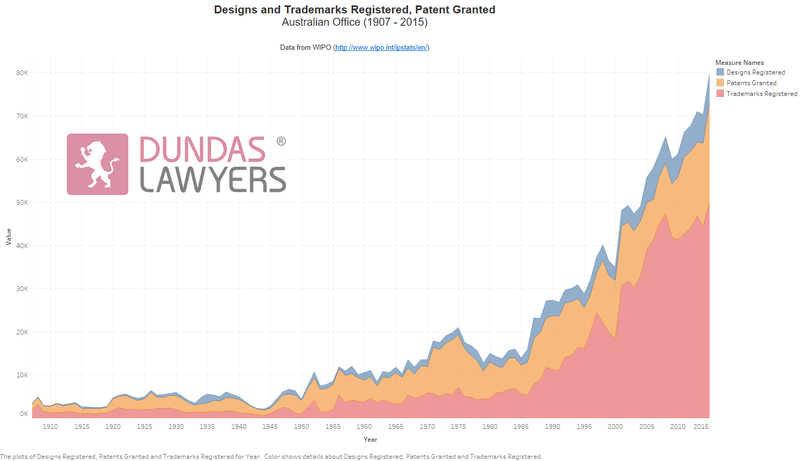 Term of Patent 20 years, s 67 Patents Act 1990 (Cth). 8 years, s 67 Patents Act 1990 (Cth). Grant process Slow (6 months – several years). Examinations are mandatory. Rapid (1- 6 months). A design, as defined in the Designs Act 2003 (Cth), refers to the overall appearance of the product and comprises of one or more of its visual features. A manufactured or hand made product may contain registerable visual designs with features including the shape, configuration, pattern and ornamentation, however, a design does not include the feel, the materials used or any infinite dimensions. It is not necessary for the visual feature to serve any functional purpose. Designs are registerable if they are new and distinctive when compared to the existing designs published within or outside Australia. must not have already been or has only recently been exploited. Copyright is a suite of rights, referred to in the Copyright Act 1968 (Cth), which protect an expression of an idea such as literary works, films, music, pieces of arts and computer software. Where copyright applies it prevents other parties from reproducing that work. Copyright automatically protects the results of the owner’s skill and effort in producing and recording the work in a material form. Copyright endows the owner with certain rights including the right to publish, present or perform the works, adapt the work or grant rights to some other person. Section 10 of the Copyright Act 1968 (Cth) provides that the term ‘literary work’ includes tables, compilations, figures and symbols expressed in words, as well as computer programs whether or not they are compiled. Section 10 of the Copyright Act 1968 (Cth) defines a “computer program” as a set of statements or instructions to be used directly or indirectly in a computer in order to bring about a certain result. As indicated above, Computer code is considered a literary work. Recent case law has placed particular emphasis on the terms ‘set of statements’ and ‘to bring about a certain result’ when interpreting this definition. That is, if code does not consist of a set of statements which relate to each other, (Data Access v Powerflex Services  HCA 49 ) or that set of statements does not bring about a certain result then what is written may not constitute computer code within the meaning of the Copyright Act 1968 (Cth). but does not include a circuit layout. Section 10 of the Copyright Act 1968 (Cth) defines ‘dramatic work’ as something that includes a choreographic show, a scenario or script for a cinematograph film, but is not the film itself. In simple terms, a trade secret is any secret commercial information that provides one business with an advantage over another. For example, trade secrets have been used by Coca-Cola for decades to ensure that its formula remains secret. Despite the lack of a settled, legal definition of a “trade secret”, their value is recognised both at law, and in equity. At law, restraints of trade can be legitimately used in order to prevent the disclosure of trade secrets, or to prevent the use of trade secrets by employees in any subsequent business or employment. Trade secrets are protected in equity by way of an action for breach of confidence even in the absence of contractual agreements restraining their use. has been communicated in circumstances importing an obligation of confidence. prevailing notions of public policy. Identifying, registering, monitoring and enforcing your organisations intellectual property rights is an essential part of any business development strategy. Intellectual property rights can represent a valuable asset which may or may not require registration in order to protect it. Whether it is a result of research and development, your marketing efforts or the fruits of your intellectual endeavours, executives and entrepreneurs must turn their mind to ensuring the appropriate protections are in place and act swiftly when infringements are uncovered. What is a certification trade mark? Should you trade mark your business’ name or its logo? What is a “Confidentiality Agreement”? Is your confidential information really confidential? If you need assistance identifying, managing or protecting your intellectual property rights please telephone me for an obligation free and confidential discussion.